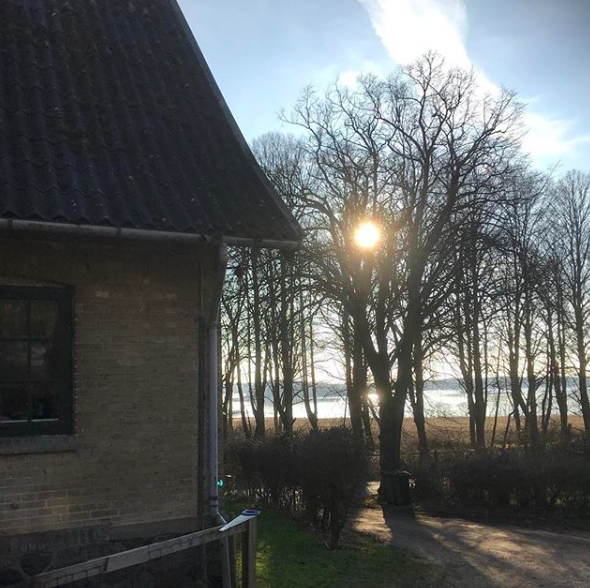 THIS IS A SPACE TO NOURISH, RESTORE, EXPLORE AND COME A LITTLE CLOSER TO A SMALL PIECE OF DENMARK’S BEAUTIFUL NATURE. As of May 2018 this humble sanctuary is open. You are welcomed here to breathe deeply, let nature calm your system and waken your senses. The back yard is the forest and our front yard the water view. The house is a double house. Our family of 5 lives in one part and the other half holds our guest room, teaching room, office and creative space. Our garden in the making, is built up around permaculture philosophy, each year expanding and evolving. It is a land filled with corners and curves, sit spots, animals and plants. Each guest is a part of creating this space. Leaving her mark on the land and surroundings. The women who stay here can eat the gardens herbs and greens, and collect eggs from our chickens. This space is open for you to engage with, becoming a part of it during your stay. During spring, summer and early fall you also have access to the Lotus Belle tent in the back. It has a woodburner stove and you can curl up for a nap or stay the night if you want to get closer to night life around here. We have dreamt up a space to unplug. A place where you have time to yourself in the forest, without being completely alone. We want this place to be sustainable, not only for people - creating a space to rejuvenate - , but also how it’s run. Everything in the house is bought second hand. We have implemented zero waste principles with the goal to, in time, become fully zero waste. We’ve created as little waste as possible both in the creating phase and now as we welcome you to stay here. These principles being: Refuse * Reduce * Reuse * Recycle * Rot (for more on this listen to my interview with Bea Johnson from Zero Waste Home). We want to be like a living showroom in terms of what a sustainable home looks like and how it works. Giving you a sacred space, as well as leaving here inspired to take small steps in your own life. As a guest here you check in solo. You have your room with a comfy bed from where you can watch the stars and moon at night. You can wake up and look at the water. You have access to the teaching room where you can meditate, dance, do yoga or whatever rituals you may have. Once a week there’s a morning yoga class, but other than that the place is yours. There is a kitchen where you can cook your tasty dishes, where you are welcome to harvest what you like from the garden. The eating area is yours to enjoy. We have bikes you can use to tour the area. We’ve created maps of beautiful walks off the grounds. As the houses are connected, there will be a few times during the day when you will be able to hear the children; you are surrounded by life. Price: 580DKK per night - included; sheets, towels, covers, bikes, maps, garden greens, tea and coffee. Arrival from 10am - until 10am the next day.